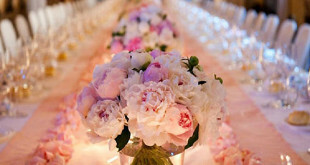 Wedding Love Follow us from the beginning, from love to wedding to parenthood. Andy Murray Met His Match! The most famous man in the world following his girlfriend finally posted a photo of their wedding. 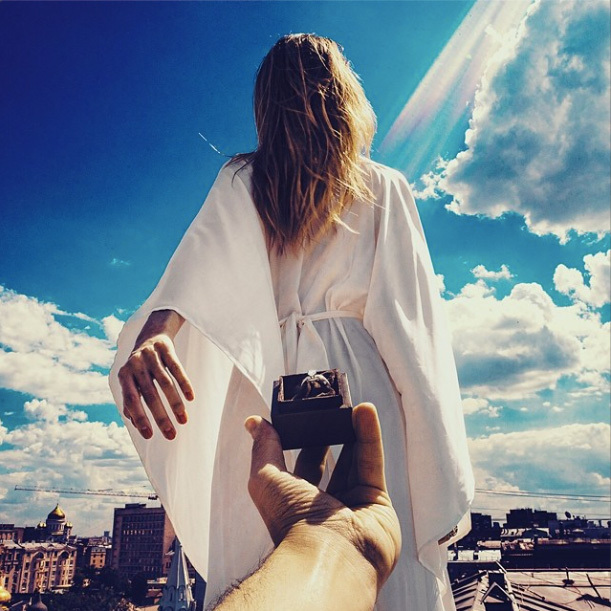 Russian photographer Murad Osmann got famous posting his photos on Instagram following his beautiful girlfriend Natalia Zakharova all over the planet Earth. For two years we have been enjoying his photos of the most beautiful places on the world, and now we got a photo where Natalia is taking him to the altar. Photo is spreading all over internet and gathering likes from romantic people all over the world. It has got over 267.000 likes just 22 hours after it has been posted on his Instagram profile (June 7, 2015). On August 15, 2014, Murad popped the question and, of course, took a picture. Murad popped the question and the answer was YES! Please take a look at their other photos from past two years. #followmeto the wedding whith my love @muradosmann promise to hold your hand and tell you I love you every day for the rest of our lives. ??????? ?? ?????? ????? Vera Wang ????? ?, ?? ??????? ??? ????? ???????? !!!!! ??????? ????????? @wedoagency ? ??????? ?????????? @lidseventhouse, ????????? ????? @zhavoronkieventhall ….?? ??? ?????? :)!!????? ?, ????? ??? ???????? #followmeto the great Taj Mahal with @yourleo. It is hard to explain the emotions that you feel the first time you see the Taj Mahal through the entrance doors. It truly is one of the world’s best wonders. God, grant me the serenity to accept the things I cannot change, the courage to change the things I can, and the wisdom to know the difference (c) Reinhold Niebuhr #followmeto Le Mont-Saint-Michel with @yourleo. It was there in Normandy, where we have just finished shooting our first feature with #hypefilm @coldfrontfilm. #followmeto the Jumbo Kingdom in Hong Kong with @yourleo. It was an amazing trip to one of our most favourite cities and we are happy it was one of the destinations on #LeTourDeBochic We had a great week at @upperhouse_hkg where our month long exhibition just came to an end. You can find more photos on our official backstage account @followmetraveller. ???????????????????? #followmeto the Eiffel Tower in Paris. Follow Nataly’s account: @yourleo ???????????????????? #followmeto the Brooklyn Bridge with @yourleo. It is a collaboration with a great artist @nois7. Robert – thank you for the great work! Also big thanx to @alexeywind for helping on the photo shoot :)! #followmeto Istanbul with @yourleo. Istanbul is very much a city of contrasts. It amazed us with the diversity of it’s districts. 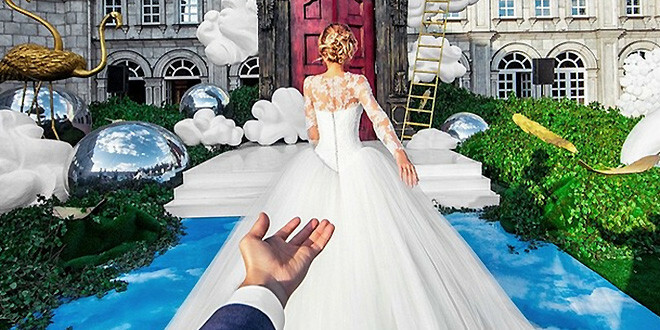 #followmeto the wedding with my love @yourleo. I promise to hold your hand and tell you I love you every day for the rest of our lives. ??????? ?? ?????? ????? 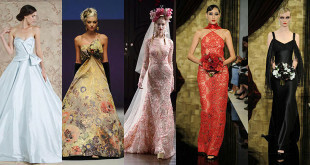 Vera Wang ????? ?, ??????? ????????? @wedoagency ? ??????? ?????????? @lidseventhouse ?? ??? ?????? :)!! 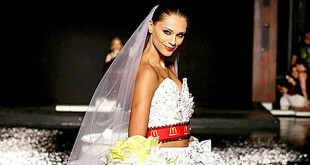 McWeddingDress is made out of cups and wrappers from the McDonald's and the creator of this impressive dress is Stephanie Castanon. 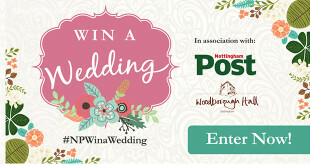 Win $50 000 Dream Wedding!